Not only did trends of recent years continue in 2013 – particularly the diverging fortunes of the rich and everyone else — but in some ways they accelerated. The stock market, as measured by the Standard & Poor’s index, was up a stunning 32 percent (through Dec. 27). 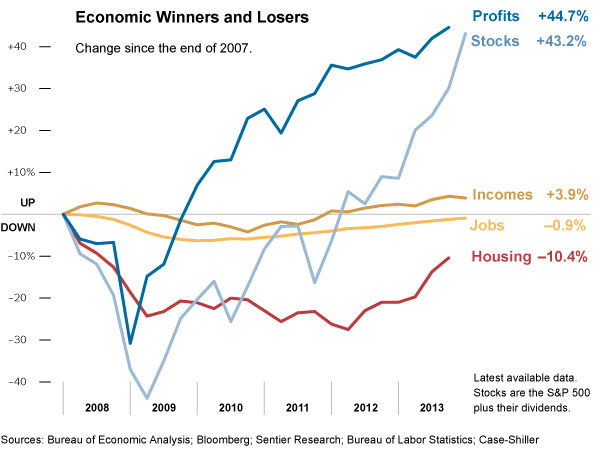 Corporate profits rose to a record $2.1 trillion. Meanwhile, incomes remained nearly flat and jobs tallies grew slowly. 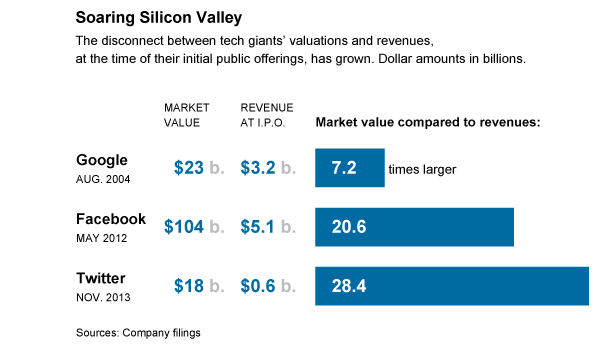 Through Oct. 30, earnings were up just 1.4 percent, an even smaller increase than in 2012. The only relative bright spot for the average American was housing; thanks in part to the aggressive efforts by the Federal Reserve to hold down interest rates, sale prices of homes were up by 13.3 percent in September, compared with a year earlier. Economic growth — a likely increase in gross domestic product of just 1.8 percent in 2013, after adjusting for inflation — was also unbalanced in other ways, particularly the impact of the government. The nation’s quickly falling deficit (it dropped from $1.09 trillion to $680 billion in a single year) cost dearly in economic activity. Spending by cash-strapped consumers and investment by skittish businesses both grew at slightly below customary rates. A flat-lining Europe dented President Obama’s pledge to double American exports by 2015. 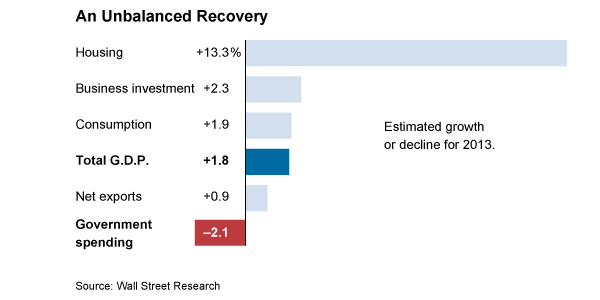 On the other hand, home building and related residential activity, depressed since the onset of the financial crisis, provided a second annual lift to the economy. Employment remained an overarching problem. While job growth has picked up steam in the last few months, the fall’s higher pace of job creation – around 200,000 per month – would still not be nearly enough to bring unemployment down to pre-recession levels. 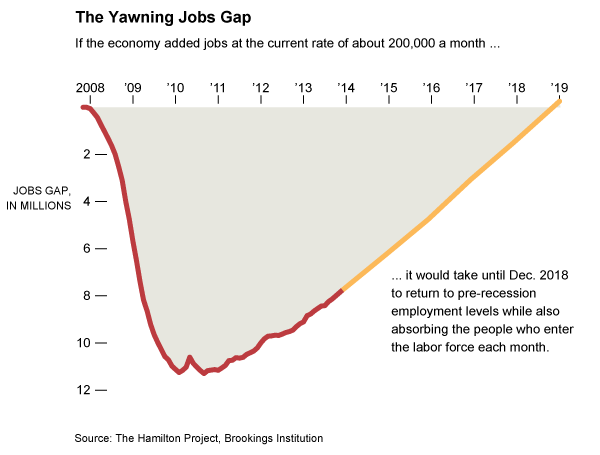 According to calculations by the Brookings Institution’s Hamilton Project, even if the 200,000 jobs per month rate were maintained, the unemployment rate would not fall to the November 2007 level of 4.7 percent for another five years. Not only has the job recovery been sluggish, but also a disproportionate number of those that have been created have been in lower wage occupations, such as retail clerks and fast-food workers. 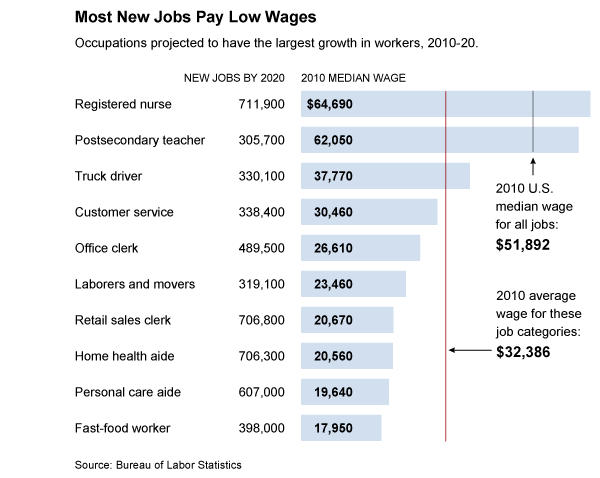 And that trend is projected (by the Bureau of Labor Statistics) to continue; using a simple average, the 10 job categories expected to add the most jobs during the current decade boasted a collective median wage of $32,386 in 2010, roughly $15 per hour and far below the United States median of $51,892 at the time. Seven of the 10 categories pay below this average. Note the conspicuous absence of manufacturing; it may be recovering, but it isn’t what is driving new jobs. Wage increases haven’t been paltry because the efficiency of the American worker has flagged; indeed, productivity has continued to chug along. But those productivity gains have simply not been passed on to workers. 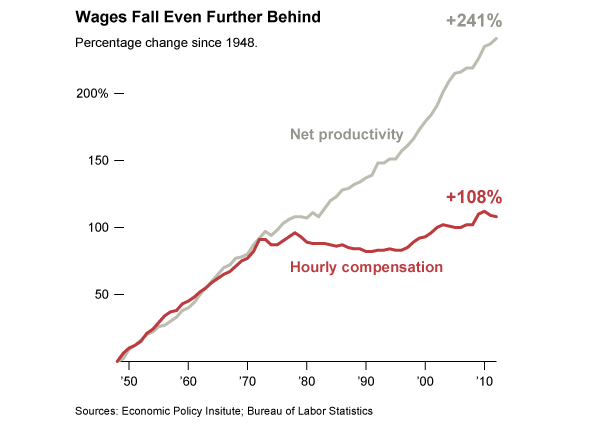 Between 2000 and 2012, productivity rose by 22 percent while wages increased by 7.7 percent. The divergence was particularly great over the last three years of that period – productivity up 4.6 percent and real wages down 1.1 percent. For this failure of the American worker to be rewarded for his growing output, blame a variety of factors, perhaps most important, globalization, which has allowed companies to move production to whatever part of the planet offers the lowest cost labor. In that respect, American workers remain in a race to the bottom. The troubles with the Affordable Care Act’s HealthCare.gov rollout sure grabbed daily headlines this fall. But throughout the commotion, little mention was made of the most fundamental aspect of the law: the way in which it raises nearly $2 trillion over the next decade — mostly from wealthy individuals and health care providers — and uses the money to fund the largest expansion in insurance coverage since Medicare was created nearly 50 years ago. As shown above, the end result should be better health care options for those closer to the bottom end of the income scale, through the Medicaid expansion and creation of exchanges with subsidies for most participants. 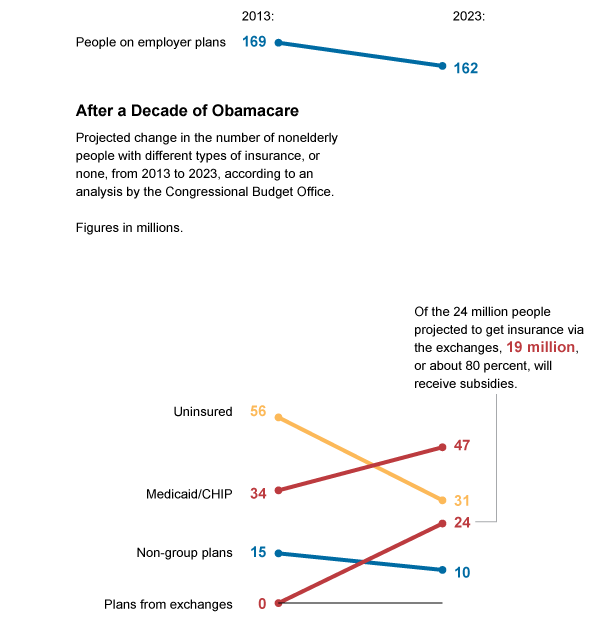 The intended result: 25 million fewer uninsured Americans. Yes, this is redistribution on a grand scale, and we should all be very proud of it. But as evidenced by Obamacare’s consistently poor poll numbers, most Americans are not feeling charitable toward the less well off. Trust in many American institutions has been declining, but few institutions have fallen so far out of grace as Congress. Last year, I showed that the previous Congress was the least productive Congress in modern times, including the famous Do-Nothing Congress of 1947-48, passing just 238 laws, 37 percent of the average of the 32 Congresses that preceded it. In 2013, the first year of this Congress, the number of new laws passed fell further, to 55 (as of Nov. 30), seven fewer than during the same period in 2011. 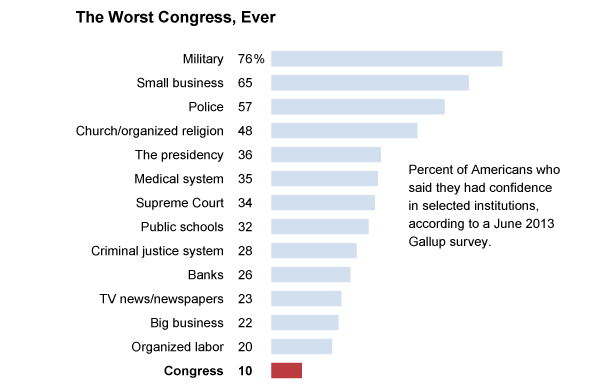 As a result, Congress now stands dead last in approval rating among key American institutions – far below other braches of government, below news outlets, below banks and even below big business. Congress well deserves that poll standing, in significant part because of the damage that it has done to the federal budget. The combination of Republican determination to cut spending and Democratic insistence that none of the entitlement programs (such as Medicare and Social Security) be meaningfully affected has resulted in the utterly inane policy of starving key domestic programs, including education, infrastructure and research and development. The recent budget fight and subsequent agreement did nothing to change that trajectory. 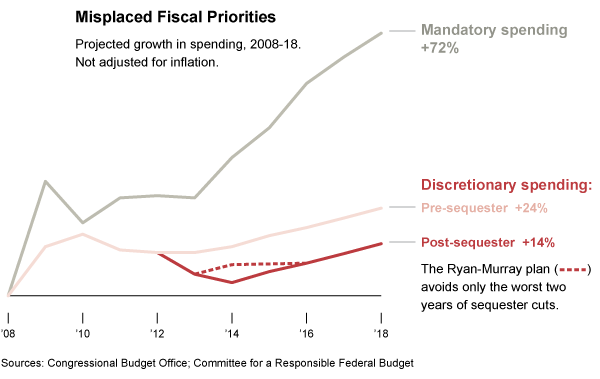 As shown by the red line above, all that resulted was avoiding the worst two years of forced budget cuts to these programs; for the 10 years beginning in 2008, this important spending will rise slightly in nominal numbers but will fall by 5 percent, after adjusting for inflation. The dysfunction in Washington has taken its toll in other important ways. 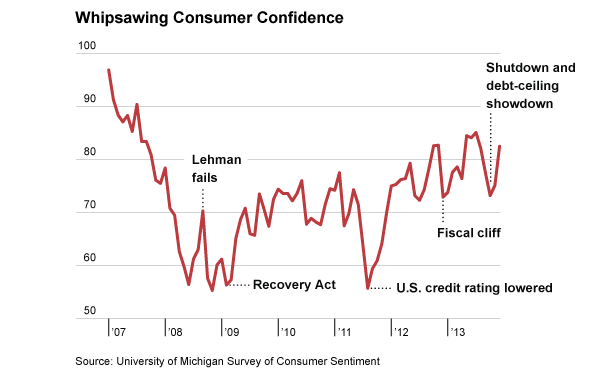 Not only has business confidence been shaken, but each new political battle has also been terrifying for consumers. 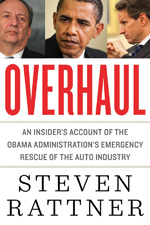 Back in the summer of 2011, when the United States had its AAA credit rating removed by S.&P. after it flirted with default, consumer confidence recorded the second biggest two-month drop ever, behind only the aftermath of Hurricane Katrina. A smaller decline occurred at the end of 2012 when Congress nearly went over a fiscal cliff. Beginning this past July, consumer confidence dropped to its lowest level in nearly two years as a result of the government shutdown, the A.C.A. problems and related battles. Now, a two-year budget nearly in hand, Americans’ moods seem to have improved. At a time when we need consumers to spend (prudently), these periods of faltering confidence have real economic consequences.